All photos by Robert Cordova and you can see the whole set here. I'm an Ironman! I've waited a year and a half to say that, and now that it's true, it's still hard to believe. Even though I wanted it so badly, I didn't know how much it would mean to achieve this goal. People say that once you've done an Ironman, you can do anything. Whenever I heard this in the past, I would nod solemnly while secretly thinking, "Oh you are so full of crap." I understand it now. It's not that there's something magical about completing a 140.6 mile race, and all of a sudden you're Superman. It's that somewhere along the way through the long hours of the race day (up to 17 hours), you have to battle your own fears and doubts. You have to choose to keep moving forward when everything in you is telling you to quit or at least to slow down. By reaching the finish line - by fighting yourself and winning - that's how you end up feeling invincible. 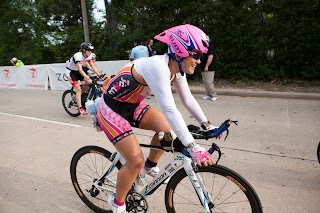 My day at Ironman Texas was all about fighting my own fears. Here's the report and I'm not even going to attempt a short version. Robert and I arrived in Houston on Thursday. This weekend's wolfpack included Aixa, Linda, Jenny, and myself. We went to packet pickup together, got interviewed for the Ironman youtube channel together, dressed alike, attended the welcome dinner, and generally had a silly giggly time together in matchy matchy clothes. Thursday was a blast. The weather was cool and overcast and it felt "ok" outside. My biggest fear (I thought) was the weather. We've had an unreasonably cool spring in San Antonio and there's been no time to acclimate to heat. 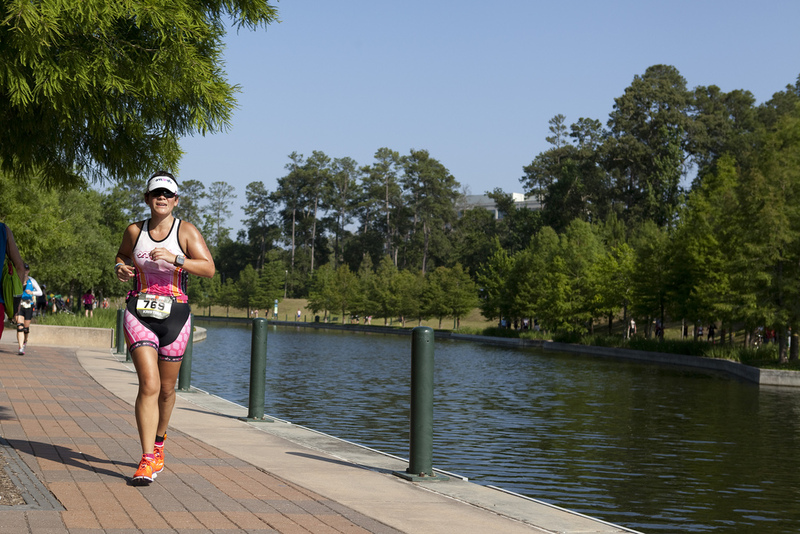 The forecast for race day was for 90 degrees, high humidity (standard in the Woodlands) and 15 mph winds from the south. 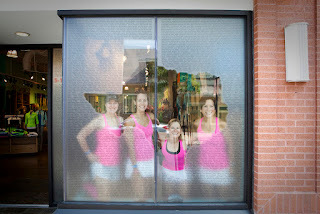 Matchy Matchy in Lululemon store, dressed in Lululemon. Jenny, Aixa, Linda and I.
Friday was the practice swim and bike check in. 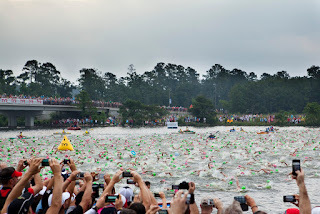 There had been a lot of anticipation about whether the race would be wetsuit legal (if the water temperature is above 76.1, you can wear a wetsuit but have to start 10 minutes late and are ineligible for awards). I wasn't planning to win any awards, but I wanted to follow the rules anyway. Assuming the water was going to heat up, we practiced without wetsuits, which turned out to be a good call because the water ended up being too warm to be wetsuit legal on race day. The water was brown and murky, just like Boerne Lake. I practiced treading water and determined that it was possible to do so without a wetsuit. A little bit of fear melted away. When we went to check our bikes in at about 2 pm, the clouds in the sky dissolved and the sun beat down on us. As the sweat dripped off our faces just standing in the shade of a tree, I wondered how race day would go. Be careful, the Slowtwitch forum advised, this race is going to be a scorcher. Slow down. Stay within yourself. On race day, Robert and I woke up at 3:45 am, picked up Aixa and headed to the bike transition to drop off bottles of nutrition and get the bikes ready. We arrived at 4:30 and hustled into transition, got everything taken care of, and started the 1-mile walk to the swim start. The humidity was oppressive; I think the day started at 76 degrees and 100% humidity, and I could certainly feel it. Aixa, Jenny, Linda and I got body marked and ready to swim. Our awesome spectators arrived at the swim start: Shelly and Patrick, Brian and Orissa, Herb, Heather...it was so great to have them all there to cheer for us. 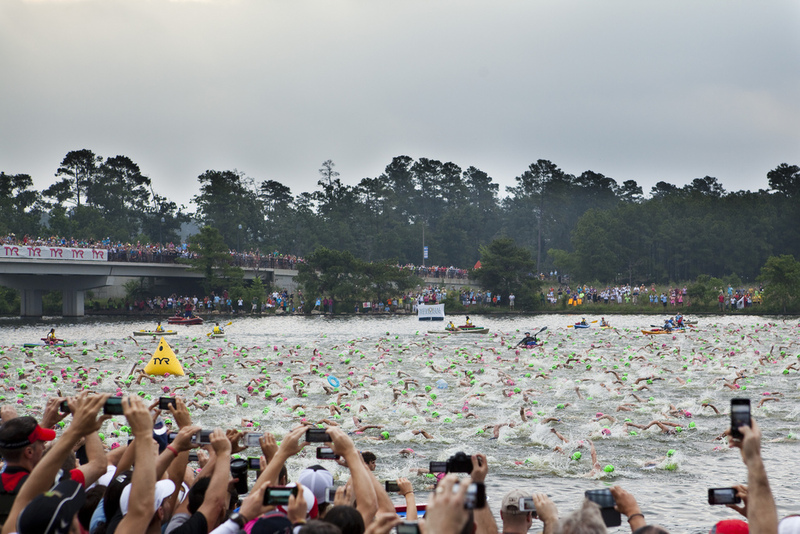 Sooner than expected, it was 6:45 and the announcer started herding us into the water. I didn't have much time to think. I felt one strong wave of nerves wash over me as I gave Shelly an emotional hug before getting the day started. Kissed Robert and walked to the water's edge in my new-to-me speed suit (from Hillary - this makes it lucky and invincible) and lucky pink goggles from camp. The washing machine and spectators lining the bridge and both sides of the lake. After about 15 minutes of treading water, the cannon went off. I was pleasantly surprised that there was way less contact on this swim than in Arizona. I had a few sketchy moments but none of the pummeling of Tempe Town Lake. The swim course was out and back, and then a right turn into a canal. We had been warned about the crowds in the canal, and I was scared about getting into too much contact there or being squashed against one of the walls. Although it was difficult to sight along the buoy line, I swam without incident, and eventually reached the canal. It was fine! There was hardly anyone around at all. Because of this, I thought, I've either crushed this swim or I'm way behind. But I always refuse to look at my watch until I run out of the water. As my feet touched the steps and I hauled myself up, I looked at my watch and shouted out my first F-bomb of the day - 1:28. A full 10 minutes slower than Ironman Arizona and 20 minutes off my goal time. Uggggh. None of the euphoria of a first-timer finishing the swim this time - I was just mad that my time was so far off the goal. I needed to shake off the disappointment about my swim and get the race started. The bike is my strength; use it! I ran through T1, grabbed my bag, and hustled into the changing tent. Opened the bag and my heart sank. I had picked up the wrong bag. Dropped a second F-bomb and ran back to the bags, grabbed the right one, and ran all the way back to the tent. Let's try this again. A volunteer dumped all my stuff out onto the ground and I got ready to ride. Coolwings, chamois cream, socks, shoes, gloves, helmet, glasses. Spare tube into my pocket and I was out the door and running for my bike. Grabbed my bike, ran for the bike mount line, got stuck behind another woman who couldn't get on her bike, heard Coachie screaming at me to get on my bike and ride, and finally got on my bike and started riding. Frustration. The first of many faked smiles. But how cute is that outfit. Surely this comedy of errors was now behind me and I could get focused on the day. But with the first pedal stroke, I felt the tightening in my adductor. Oh my God, this is going to be a long day if it's already hurting. I sat up to try to let it warm up a bit. After about 20 miles, it finally warmed up and I felt good. I felt generally sluggish, but good. Then I tried to get down in my aerobars and ride, and I just couldn't do it. With all the people around me, passing me, being passed by me...I was so afraid that one of them would bump into me and end my day that no matter what I tried I couldn't get into my aerobars. I decided that I had about 5 more hours to figure it out, and just kept sitting up, riding, moving forward. I knew I was behind because of the swim, I was off my predicted pace for the bike, and I was just going to survive this day and maybe get lucky and have a good pace on the run. The attitude stayed positive. And then I got stung by a red wasp. WHAT THE F. It bounced off my helmet, landed on my inner thigh right at the line of my shorts, and stung me. If you know me at all, you know I have a deathly fear of bees/flying stinging insects in general, and I've never been stung by one. I thought, what if I'm allergic? Ouch that hurts! Just keep riding. And then I was proud of myself for not crashing my bike, because a couple of weeks ago I had a bee land on my arm and I almost took Robert and myself out trying to wave it off. To not wig out and start crying was a huge mark in the plus column for me at this point in the race. The next 30 miles were uneventful. Drink every 10 minutes. Take a water at the aid station, pour it on yourself. Take another bottle to drink for the next 10 miles until the next aid station. The course was smoothly paved with rolling hills, and the sun beat down with not a cloud in the sky. I was alone on the course, unlike at IMAZ where Shelly and I got to leapfrog. I didn't know where any of my friends were, but I assumed they were in front of me. With 3 hours done and at least 3 more hours left to go on the bike, I felt lonely. At 60 miles, you could pick up your special needs bag if you wanted to. This is a bag that you've filled with whatever might get you through the rest of the ride. Mine contained a spare tube and CO2 and various foods. I didn't take the bag, but I took the opportunity to stop and eat half of a delicious HEB glazed cake donut that I had smashed in my bento box "just in case." The donut served as a huge pick-me-up and I raced off with a surge of energy that would last 10 miles. After the 70 mile point, things started to really break down on the course. We were fighting a headwind. People were hot and they were starting to pull off to the side, remove their helmets, and lay down in the grass. At aid stations, they came to a complete stop, clustering around the volunteers and just standing there pouring water on themselves. I joined in - why not. My bike split was going to be so much longer than I expected it to be, why not try to stay cool? And that's how the rest of the ride went. Every 10 miles, stop, get water, drink, keep going. I never got into the aerobars unless there was nobody around me (or there was a photographer nearby). At about 90 miles, I stopped again to eat the other half of my amazing donut. And then finally, blissfully, there were only 10 miles left. Six hours had already gone by; I had been planning to finish the entire bike leg in 6 hours. 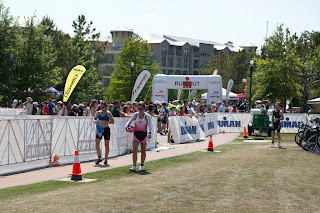 I counted down the final miles, took energy from the cheering spectators, and rolled into transition. That's some slow, sad walking. I said it would be a victory to make it to T2, and it was. But I was in a bad headspace thinking, Oh my God I have to run a marathon now. What if my hammy/adductor starts to hurt. This is such a long day already. It's so hot. At this point, according to reports, the heat index was 100 degrees. The wind that had pummeled us on the bike course would now be a blessing. Robert was yelling at me from outside the transition "Go Baby!" and I yelled back, "It's HOT! This is what suffering looks like!" as I walked slowly to the run bags, trying to take off my helmet with fingers that didn't work. "It's not called EASYMAN," he teased me. I yelled "I love you," he replied the same, and I walked into the changing tent. The volunteers were great. They refilled a bike bottle that I had brought in with me with water, helped me to change my socks and shoes and remove my coolwings, and I was off on the run course. Finally feeling happy(er) after 10 hours of racing. I forced myself to try be happy to be on the flat, 3-loop run course that weaved through wooded trails, along the Waterway (which is similar to the Riverwalk) past the swim start and along the lake, and through a bunch of fabulous neighborhoods. After 6 months of crying that I didn't get to do it in Arizona, I was supposed to be happy about this. And then somehow, I actually was happy about it! I was smiling and running and enjoying myself for the first time in 8+ hours. I ran really slowly, about 12:30 miles, but I didn't even care. I was moving, nothing hurt, and the only thing that was wrong was that I was tired. I had nailed my nutrition on the bike course. I was ready to get this done. The spectators were loud and energetic and covered nearly every inch of the run course. There was never a time that I was alone. Motivational signs lined the course and there were themed cheering sections with music and craziness. It was awesome compared to the bike leg. In the first loop, I saw friends along the course and was informed that Aixa was 20 minutes ahead of me. Ok...my goal is to catch Aixa. At every mile there was an aid station that had wonderful volunteers who served up gu, water, sports drink, ice, and cold sponges. For the first 12 miles, I kept up with the nutrition plan of gu, water, and sports drink. Ice in both hands and down my shirt cooled me down. And then I couldn't do it anymore. I started trying other things - coke, chicken broth, bananas. The bananas helped me feel better, but I was worried that I wasn't getting enough salt. Then I felt the urge to pee. Oh good, I thought, peeing is good. It means you're not dehydrated. The problem is that once I started, I couldn't stop! At every aid station between miles 12 and 23, I stopped to duck into a porta potty. I started to worry about what was happening to me. Somewhere during that time, I spent a mile or so walking and feeling sorry for myself. Oh man, I think this is the low point that Dawn says is inevitable in every race. Then I forced myself to cut it out. My legs didn't hurt, I was just tired. Samantha McGlone had told us at camp - the best way to end the suffering is to get to the finish line and the fastest way to the finish line is to run, so RUN! Hillary has said that you should never walk unless you have to, unless it's too painful to run. I wasn't in pain, so I ran. With 3 miles to go, Robert appeared in a spot that I wasn't expecting him. And to my surprise, Mom and Dad were with him. They weren't supposed to be at the race - how cool is that! They were screaming and telling me to keep up the pace, and I did! I kept running until I reached the little out-and-back right before the course split off to the finish line. As I ran down the hill with less than a mile to go, I saw Aixa and Roland walking together. This put more energy into my legs and I ran as fast as I could. I caught up with them right before the finisher's chute. Without slowing, I bellowed, "Come on! Let's run to the finish!" and we ran up the chute into the lights and the noise of the crowd. I intended to spend enough time in the chute to appreciate this first Ironman finish line. So I told Aixa to slow down, to enjoy it. I high-fived every hand I saw, including Brian and Orissa and Shelly and Patrick! And then I saw Robert and Mom and Dad and I came to a complete stop to give each of them a kiss. "Go on!" they yelled, but I was laughing and didn't care. It was so awesome. 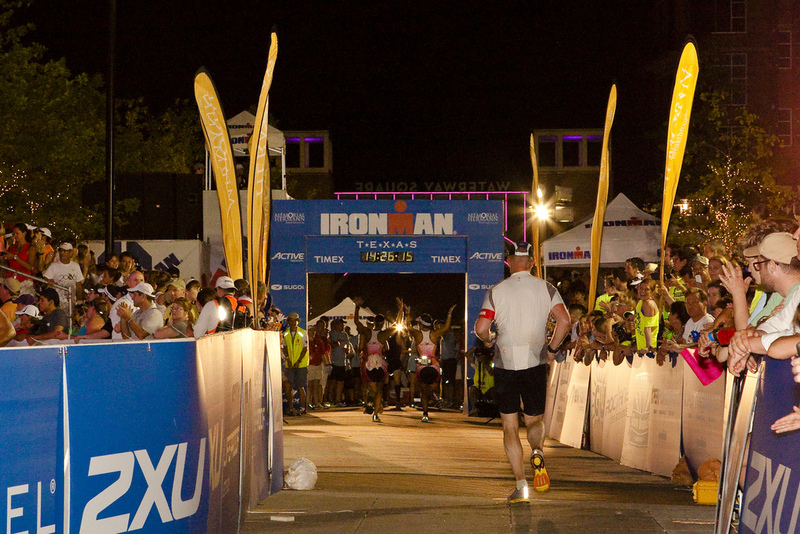 Aixa waited for me and then we ran together to the finish line and as we crossed under that iconic blue archway, I heard Mike Reilly yell out those amazing words, "KRISTINA SWANN CORDOVA, YOU ARE AN IRONMAN!" Someone tried to give me a medal but I said NO, I need to get it from Herb, my Iron Whiner friend who was volunteering at the finish line. The thought of reaching the finish line before his shift ended at 9:30 had carried me through the last hour and a half of the race, and I had made it with 4 minutes to spare. Although I got my medal from another volunteer, I found Herb and hugged him and cried and told him how hard the race was and he just said "I know," because he does know. He helped me through to get my hat and t-shirt and have my picture taken one more time, and then I was handed off to Robert, who hugged me tight and told me how proud he was. Mom and Dad were there and I could see the pride in their faces, which really touched me. Coachie was on the other side of the finish line and I ran to hug her through the fence. She told me she was proud of me and talked about how far I had come, and I asked her "When is the next one!?" which shocked me. What an amazing day. With a final time of 14:26, I was nearly two and a half hours off my goal time. But I didn't care. I was just so happy to have done it, to have overcome fears, to have fought myself and won. A year and a half of training - worth it. Soooo worth it. Of course I couldn't have gotten through this without the support of my incredible Iron Sherpa husband Robert; our kids Andre and Julia (who think I'm a professional, no matter how frequently I inform them that this isn't the case); Coachie Dawn Elder, who always believes I can push boundaries that I didn't even know existed; Grand Coachie Hillary Biscay who helped build my confidence so much at camp; the Iron Whiners (it's so incredibly cool that all of the Whiners are now Ironman finishers!!! ); Shelly, who has helped me mentally prepare for this race since December and who has listened to every gripe and worry and has set my mind at ease each time; and all my friends and relatives and coworkers who have been cheering for me and rooting for me for a year and a half - THANK YOU. Three weeks ago, I was ready to crush Ironman Texas. Then, I guess all the weeks of training caught up with me and it started to crush me. Linda and I did our last big weekend of workouts - I think it was a 4 hour ride and then a brick run, which we smashed. And after the workout, that same adductor/hamstring that had been bothering me for weeks (maybe months at this point) reminded me of its presence and I got a little nervous. That didn't stop me from running 20 miles the next day. Halfway through the run, I really started to feel some discomfort, but it's nothing I haven't felt before, so I kept on going. After the run, I could barely lift my foot from the floor and support my weight when taking off my shorts to shower - not a good sign. Advice from Coachie - "Shut it all down for a week! Swim only! Let this heal!" Fine. I went to get a massage, which helped, and then spent a week just swimming. This would fix everything, right? Well I guess it might have, except that what happened next, on that last day of the swim-only week, was that I started coughing. This is weird. What's happening? The next morning, a mild fever, more coughing, and I felt like I'd been run over by a truck. Oh, good timing, it's a common cold. I missed the ride that day, and the run the next day, plus two days of work on Monday and Tuesday. The cold lingered for another week. ARGH! This is now two weeks now of barely doing anything, and I'm supposed to crush an Ironman in just three weeks! Advice from Coachie, Shelly, Robert - "Don't worry. You have plenty of time to get rid of this cold, start feeling better, and then crush the Ironman." I took the necessary days off and then tried an easy run with Shelly on Wednesday. Four little miles at an extremely moderate (aka slow) pace, and I coughed my lungs out afterwards AND limped around for the rest of the day. My leg hurt even lying on the couch that night. Went to see my regular doctor about the cold (yes, confirmed that it's just a cold. Not anything worse, thank goodness) and then to a sports doctor about the leg (Tim Palomera, Robert's dear friend from high school, who was able to get me in quickly to see what's going on - THANK YOU, TIM!). Tim determined that I have a hamstring strain and that 3x a week of physical therapy and NOT RUNNING UNTIL THE RACE is what I need to do. He said I can still race, so that's the good news. So now it's two weeks before the race. I have barely done any real workouts in two weeks. I am still fighting off the cold. And I'm panicking more than a little bit. Advice from everyone I know, including Coachie, Shelly (who was in this exact position last year, and crushed her Ironman), Robert, and the Slowtwitch community (yes, I posted a question on Slowtwitch, that's how panicked I felt)... and everyone says the same thing - "Rest! The race will be fine! The hay is in the barn. You have the fitness. It will be fine." I just have to believe them. I'd rather be feeling amped up and excited to race right now, instead of being unsure and nervous, but I'm learning to roll with it a little bit more than I'm used to doing. I just keep getting more lessons out of this journey, and I'll accept that this is good for me. May 18 is on it's way and I'll be there on the start line. The silver lining - I've spent more time with Robert than I've been able to in a long time. We even got to ride an easy 30+ miles to Castroville and back to get a donut, and it was so much fun! Do I wish I was out there running today with the girls? Yes. But spending an entire weekend with my hunny bunny isn't a bad alternative at all.